When the ‘Let My People Go’ campaign started the idea was to put pressure on the Soviet government to let the Jews migrate to Israel. It was the dream of the Israeli ultra right to build a base for themselves composed of ardent right wing, anti Communist zionists that could be moulded into the racist element that eventually elected an Avigdor Lieberman. Truly a zionist success story….. It was realised by a good part of these newcomers that Israel wasn’t the place they wanted to be. We saw the birth of the ‘Let My People Leave’ campaign. Leave for where? That was the question….. but the answer was obvious; The United States. Where else could a racist, criminal element feel at home? It was a perfect plan….. Illegal ways had to be found to make this dream a reality. By hook or by crook, these folks were going to find a way out of the new Gulag they were living in. Obtaining a visitors permit is not impossible for a short stay in America …. getting an illegal job selling ‘beauty products’ in malls or being a part of a locksmith scam is not impossible either…. but for how long? Much of this is done with the assistance of the Russian Mafia, a network set up to aid and abet these potential criminals, at least until a way is figured out to get a Green Card. Best way for that is to marry some unsuspecting American girl, quite often arranged for a fee. The plan is to stay married for a prescribed period of time and then one can be free again, legally free. Quite often, these Green Card schemes originate in Israel itself. The Russians often frequent social places where American students hang out; bars and university cafes. The intention is to meet and ‘befriend’ some unsuspecting foreign student. Quick ‘romances’ develope and before you know it, there’s an engagement announcement. Now that the fall term is about over, many of these students are returning home …. quite often with their perspective ‘mates’. I’d love to be a fly on the wall when these middle class spoiled brats return to their family arm in arm with some drug crazed or drunken Cossak…. should be an interesting scene. ‘But I love him’…. 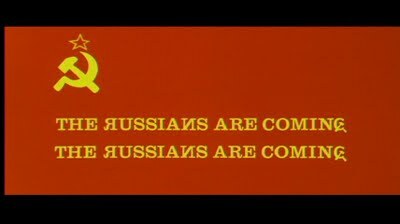 So prepare yourself America, The Russians Are Coming! The Russians Are Coming!! Truly a case of Israel’s GAIN is America’s LOSS!! with mid-ranking US military people…now that is getting interesting. They’ve been coming since early in the 20th century. The cancer spread and the host consumed. Problem is, where are there any hosts left?